This contest is open to all residents in Singapore and Philippines of age 18 years and above. The prize is 4 days / 3 nights stay with daily breakfast for 2 persons at the Shangri-La Hotel, Chiang Mai, inclusive of return Chiang Mai Airport/Hotel transfers. Like the Tourism Authority of Thailand (Singapore) Facebook Fan Page and answer two very simple questions here. 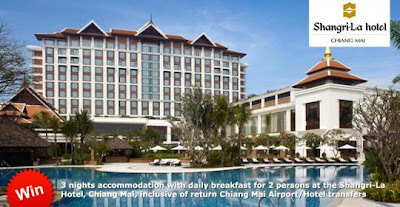 Deadline of this travel promo is on 30 April 2013 at 11:59:59pm Singapore time. Contest results will be announced on 10 May 2013.
great article,I am so interested on what I read, good and useful content.Thanks for share me that nice post.